This topiary frame is hand weaved with a smooth flowing technique and mounted on secure metal topiary frames. Its wire frames may be opened up for placement of topiary trees and topiary plants. For example, this topiary form is excellent for growing ivy, jasmine and other types of climbing plant; we frequently see this used with topiary balls. Can be used inside, outside on your lawn as a beautiful decoration. Topiaries add elegance to your patio or topiary garden and each one is a unique sculptured work of art. Our products are hand made and ship from California, US to anywhere worldwide. They are easy to use, top quality, affordable, and most importantly we have great customer service. Check out our other topiary art works and feel free to contact us if you have a question. In regards to our return policy, you have 30 days to return any item for a 75 % refund. We calculate this amount by deducting 15% for shipping and 10% for restocking from the original purchase price. As soon as we receive the item, we will process the refund. Manufacturer: S.K 703 Topiary Inc. Brand: S.K 703 Topiary Inc. 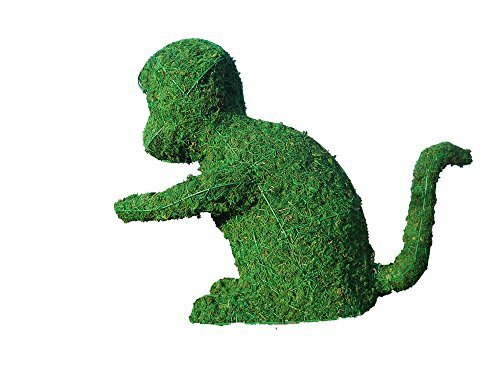 Publisher: S.K 703 Topiary Inc. Studio: S.K 703 Topiary Inc.
View More In Artificial Plants. If you have any questions about this product by S.K 703 Topiary Inc., contact us by completing and submitting the form below. If you are looking for a specif part number, please include it with your message. By S.K 703 Topiary Inc.